A while back I posted an entry on How to build a package including extra files or exclude files a reader posted a question to StackOverflow.com asking how to exclude files from the created package based on the configuration for the project. He asked me to take a look at it so I figured it would be a good blog post. From the previous post we can see that the way to exclude files from packaging is by declaring an item as follows. 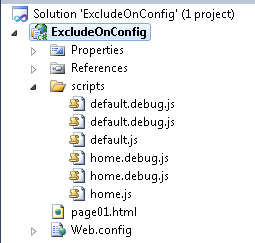 So we need to extend this to only exclude files if the config is a certain value. Since MSBuild supports conditions on almost every element this is going to be a breeze. 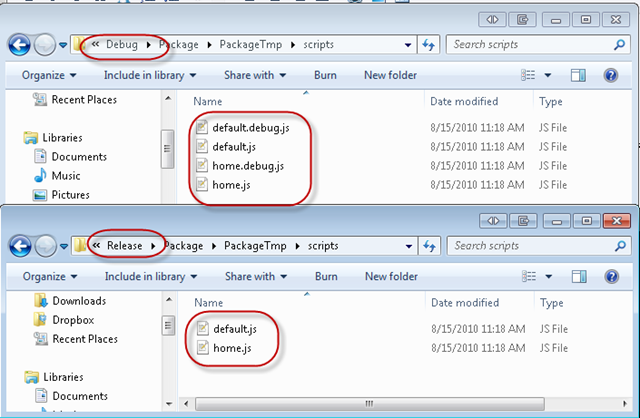 As an example I have created a sample web project with a scripts directory that has the following files. 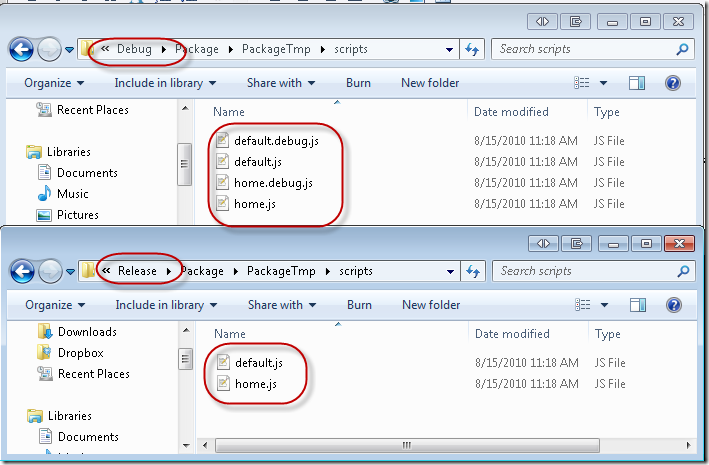 In that folder there I there are two files which have ‘debug’ in the name of the file. 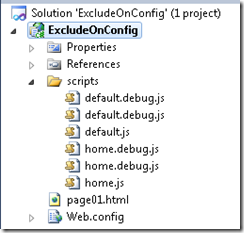 We only want those to be included if the configuration is set to Debug, or another way of putting it is we want to exclude those files if the configuration is not Debug. So we need to create to add files to the ExcludeFromPackageFiles and guard it with the condition that the configuration is not debug. Here is that. You can see the item group defined above which does what we want. Please note that I put this inside of a target, CustomExcludeFiles, I will discuss why in a bit but let’s stay on topic now. 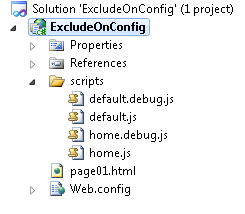 So this is pretty straight forward when the item group is evaluated all files under scripts which have debug in the file name will be excluded if the configuration is not set to Debug. Let’s see if it works, I will build the deployment package once in both debug & release then examine the contents of the Package folder. So we can see that the files were excluded from the Release package. Now back to why I declared the item group in a target instead of directly in the project file itself. I noticed that if I declare that item in the project file there are some visual issues with the representation in the Solution Explorer. To be specific the files show up as dups, see image below. I have reported this to the right people, but for now this is a harmless issue with an easy workaround.